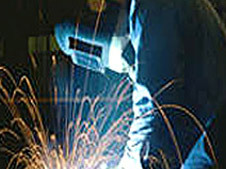 Welding Services - Stacy, Minnesota - Wyoming Machine Co.
Augmenting our diverse metal forming capabilities is our quality contract and production welding services. We utilize welding processes such as MIG, TIG, spot, stud and brazing. We're also specialists in the free-hand welding of steel, stainless steel and aluminum parts weighing up to 500 lbs. In keeping with the superior quality, performance, weld inspections are performed by AWS certified inspectors. We also offer die penetrant, leak and non-destructive testing, as well as geometric dimensioning. Our broad customer base and reputation for quality are also reflected in our ISO 9001:2008 certification. Over the years, our clients have also come to rely on us for additional services such as design for manufacturability, machining, assembling, quick-turn prototyping and much more. For more information on our contract and production welding capabilities or our value-added services, see the table below or contact us directly. .sldprt, .igs, .iges, .step, .stp, .dxf, .dwg, .prt, .prt.